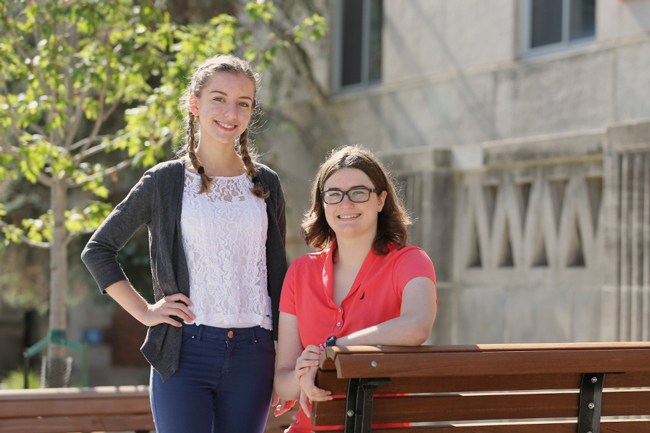 Katherine Sirois of Quebec and Iveta Demirova of British Columbia have been named McGill’s recipients of the prestigious Schulich Leader Scholarships. Created in 2011 by Canadian business leader and philanthropist Seymour Schulich, this annual scholarship program encourages promising high school graduates to embrace STEM (Science, Technology, Engineering, Mathematics) in their future careers. Although they hail from different provinces, McGill’s newest Schulich Leadership Scholars shared a common reaction when they heard the news about receiving one of Canada’s most prestigious scholarships. “I could not believe it. I was totally in shock,” says Katherine Sirois, McGill’s first Schulich Leader Scholarship recipient from Quebec, who received a $100,000 Scholarship. “I remember being completely astounded,” adds Iveta Demirova, a student from New Westminster, British Columbia, who received an $80,000 Scholarship. Created in 2011 by Canadian business leader, philanthropist and McGill graduate Seymour Schulich, BSc’61, MBA’65, the Schulich Leader Scholarship program encourages promising high school graduates to embrace STEM (Science, Technology, Engineering, Mathematics) in their future careers. This year, more than 1,300 Schulich Leader nominees from across Canada vied for 50 scholarships, valued at up to $100,000 each. Both Sirois and Demirova epitomize the word “promising” through their academic achievement combined with a passion for discovery and leadership in their communities. A graduate of Cégep Édouard-Montpetit in Longueuil and Collège Durocher Saint-Lambert High School, Sirois was selected for her outstanding academic record and her achievements in science innovation during her high school years, representing Quebec in three Canada-wide science fairs, building solar cars and developing ecological LEED (Leadership in Energy and Environmental Design) home systems. After the death of her great aunt who lived alone, Sirois then turned her attention to developing a fall detector device for the elderly. Another innovation was a ‘neuro-chapeau’ hat designed to analyze brainwaves and prevent tired drivers from falling asleep at the wheel. She says she’s looking forward to further developing her inventive spirit on campus. Iveta Demirova is a graduate of New Westminster Secondary School in New Westminster, B.C. The 18-year-old student was selected for her academic achievement as well as her accomplishments in scientific research. Most notable in her research was the development of a novel HIV therapy which earned top honours at the 2016 Sanofi Biogenius Canada competition, a prestigious national science research competition. She has also demonstrated exceptional commitment to her community as founder and president of the first branch of the Initiative for Neuroscience and Dementia in B.C., an organization which promotes and funds research to find cures for neurological diseases, bringing together partners and government organizations. Andrew Mahon is a Communications Officer in McGill's University Advancement unit.